Yves originally visited Hungary in 2013 where together with Andras and Tibor Nádasi, the previous President of the Hungarian Federation they met the Hungarian State Secretary of Sport. Yves Aubry, Josef Harsanyi and Géza Homonnay, the new President of the Hungarian Bridge Federation, very much wish to continue this project. So once again we met the Secretary of Sport – thankfully unchanged after the Hungarian elections - and he is still very cooperative and wishes facilitate this project, providing us with financial assistance, and to stage it in Budapest or Balaton Lake. Following the meeting, the delegation visited 5 possible venues: 4 in Budapest and 1 in Lake Balaton, 100km from Budapest. It was immediately apparent that one of the venues in Budapest was unsuitable. However there are still three possibilities : one in the Olympic centre (full ready and the least expensive for Hungarian Federation) one in a new football arena under construction which will be completed next August: very nice and exciting but unfortunately there are no hotels close by and the third in the centre of Budapest in a beautiful 5* hotel but the space is limited and almost certainly too expensive for the Hungarian Federation. Mr Aubry will return to Budapest in September to visit some different venues and to discuss the budget in more detail with the Hungarian President. The delegation was accompanied on the visits by a representative from an event agency in Budapest who will make a presentation to the EBL Board in Opatija. Mr Aubry hopes to meet the President of the Republic, János Áder, who is a bridge player and fully supportive of this project when he returns in September. Over Easter a test match was organised in Budapest featuring the Hungarian Senior Team, World Champions in Lille 2012 and the German Senior Team. 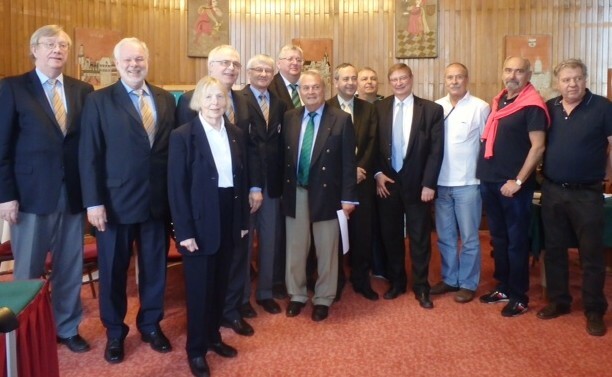 The Presidents of both the Hungarian Federation, Geza Homonnay and the German Federation, Ulrich Wenning were present, together with Josef Harsanyi, a member of the EBL Executive Council who was born in Hungary. The match was extremely enjoyable and friendly and was broadcast on BBO over the three days. The conclusion was a draw at the end of the 96 boards – 208 / 208. On 16th April, the president of the Croatian Republic, Ivo Josipović met the Croatian organisers of the European Championships to be held in Opatija in Zagreb. Mr Aubry was invited but unable to attend owing to a previous commitment. 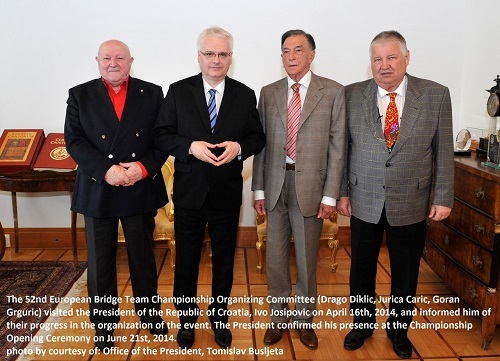 Mr Josipović, who attended the Opening Ceremony of the Champions Cup last November, renewed his full support for the European Championships in June. He stated that he would try and attend the Opening Ceremony, and also provided some assurance that the event would receive maximum financial support from the relevant authorities.